Most of the solutions regarding the removal of SuperSU required a rooted device so my next option was to restore the MeMO Pad 8 to its original state since, obviously, that didn’t happen when I unrooted it. I managed to get the stock image from ASUS’ support site but I ran into another problem — I couldn’t get into the recovery menu no matter what button combination I pressed. Some research later, I downloaded and installed the ADB and Fastboot utilities and read up on the commands I should be using to get into the recovery menu. I thought I had found a sure solution to my problem this time but it turned out that only ADB was able to find the device. Fastboot couldn’t and I never figured out how to get it to. Luckily, the tablet responded to ADB commands. Unfortunately, after telling the tablet to go into recovery mode, I got the image of the disabled Android on its back with words “No command” under it. Joy. Back to Google I went. About every web page I checked offered some version of “hold power button and then press volume up or volume down when the manufacturer’s logo appears”. It never worked before so what were the chances of it working now? Of course none of those instructions did. If you are trying to get into recovery mode, and see an android on his back with No Command, then press and hold Power, then tap Volume Up once, then release Power. This will display the Recovery Mode Menu. In the end, I put the archive on the micro SD card and selected to apply the thing as an update. The process went through without a hitch. By this time, I was getting very tired of seeing this screen. 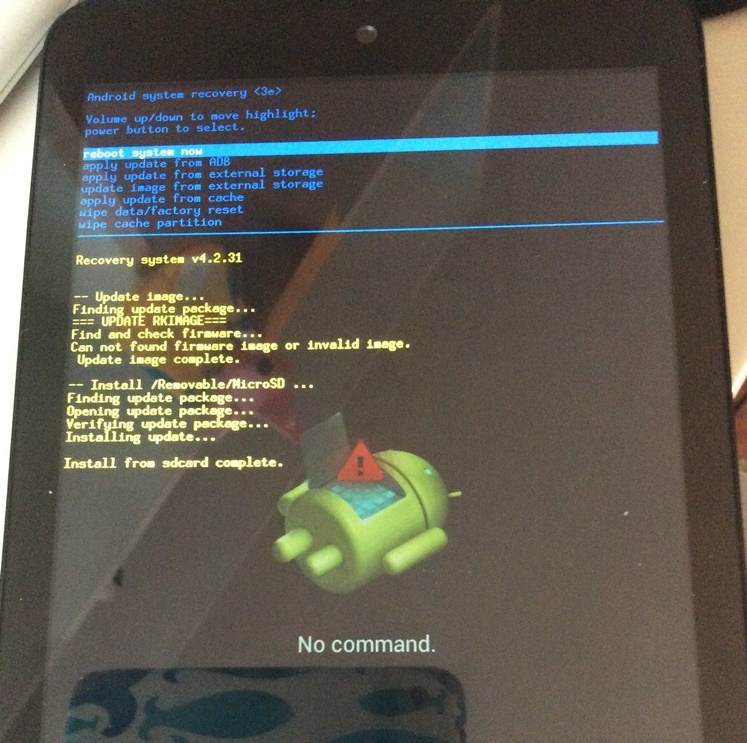 I thought the tablet was back to stock with no trace of root but it clearly wasn’t the case. I’m not sure what exactly solved my issue but I recall my next step was to use the recovery menu to do a factory restore. After I was done setting up the tablet, I immediately went to the Play Store to check if there was anything that could verify if my device still had some modified files and whatnot on it. I found and downloaded Root and SafetyNet Checker. The results showed that the MeMO Pad 8 was not rooted, had no SuperSU installed, but still had BusyBox on it. Sigh. It passed the SafetyNet check though. There IS a problem with playing it on the MeMO Pad 8, however. The game is extremely prone to lagging; It happens after a few minutes of gameplay and it slows to the point that you may have to wait over a minute before the characters move again. Closing the app and then restarting it allows me to play for roughly the same amount of time before lag occurs again. Loading the game after rebooting the device seems to prolong the game running at a regular speed before massive slowdowns kick in. Connection errors pop up a bit as well but they go away eventually. Previous PostTiny Farm: The Event Lucky Bag DrawNext PostAnimal Crossing: Pocket Camp — What’s Wrong with the Game Designers?